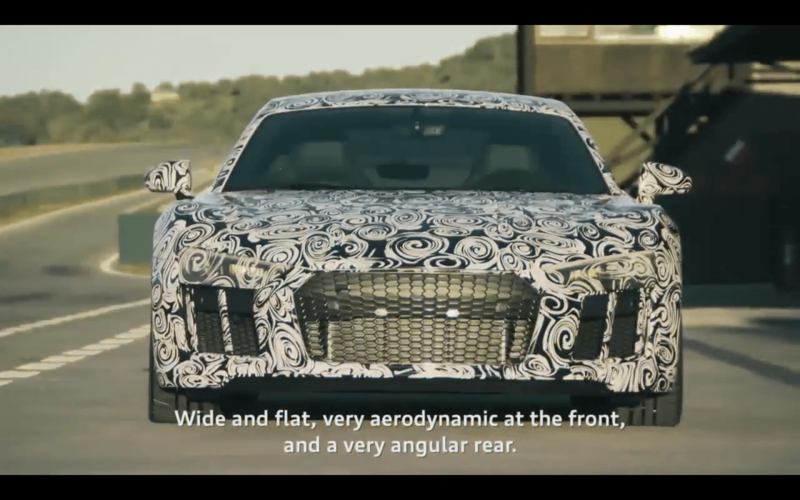 Audi has just released a new video of a second-generation R8 prototype testing around the track. Over the film’s 83 seconds, you get a pretty good look at the supercar’s ‘new’ shape, which truth be told isn’t that different than the first-gen model. The coupe is heavily wrapped with disorienting camouflage, but the car’s revised front fascia and more angular rear and are shown quite clearly. You also get a taste of the R8’s beefy exhaust note. As we reported earlier this week, the second-gen R8 will exclusively equip naturally aspirated V10 engines at launch. The new car’s 5.2-liter V10 puts out 532 horsepower and 399 pound-feet of torque, 7 hp and 8 lb-ft more than 2015’s V10. It’s also 102-hp more than the current V8, which will not be offered for the 2017 model year at the time of this writing. The base car will accomplish 0 to 62 mph in 3.5 seconds and 0 to 124 mph in 11.3 seconds. The range-topping ‘V10 Plus’ variant takes the Audi to a whole new level. With an output of 610 hp and 413 lb-ft, it now has the power to take on its Volkswagen Group bunkmate, the Lamborghini Huracan. 0 to 62 mph comes in just 3.2 seconds in the V10 Plus, which also fits ceramic brakes as standard. Also new for 2017 is an electro-mechanical steering setup, which will reportedly adapt to dry, wet, and even snowy conditions. The R8 will also be available with Audi’s trick new laser headlights. The R8 will be stripped of its camo during the 2015 Geneva Motor Show, but you can watch the debut online right here on March 3rd.